Internationally renowned lidding specialists and pioneers of the lidding technology used for aluminium foil trays, KM Packaging Services Ltd, is seeing a sharp increase in demand for more secure film solutions as the global popularity of pre-prepared meals continues to flourish. With the highly affordable ‘dine in’ trend seeing no signs of abating, the largest growth area has been in ready to roast joints and cuts of meat, however, food manufacturers are having to grapple with the rising costs of meat, which in turn has placed increased pressures to ensure long-term product safety. One of the most common problems with meat products is their tendency to release moisture, which, if lidding seals are not secure, can cause the product to leak and spread bacteria to other goods. All of which would need to be discarded. This type of wastage can have a significant financial impact on any business. KM Packaging has been helping food manufacturers achieve reliable seal integrity of lidding film for aluminium foil trays for over a decade and has one of the largest stock holdings of film material in Europe. 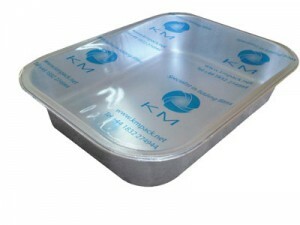 Recommended by suppliers of foil trays from all over the world, KM Packaging is recognised for its in-depth understanding of the food manufacturing processes, industry issues, country specific legislations and consumer demands. This broad sector knowledge coupled with the company’s unrivalled range of film solutions ensures that it is able to deliver flexible and reliable lidding solutions for both lacquered and non-lacquered foil trays. The company has extensive experience in working with a range of film thicknesses as well as specialist applications such as high barrier films used for gas retention with MAP processes, anti-fog films and ovenable solutions. One UK based customer, (who for contractual reasons cannot be named) commented: “We supply leading retail brands both in the UK and overseas with a range of oven ready pre-prepared meals and one of our biggest issues had been understanding how different film materials reacted with different foil trays in different environments. Receiving such high praise has become a common occurrence for KM Packaging and is a testament to its hard work and attention to detail and its focus on giving customers what they want. The company prides itself on delivering a very hands on approach and is well-known within the industry for its technical expertise and comprehensive product knowledge.